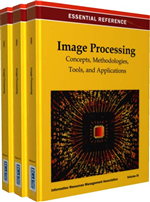 Image processing operations have been classified into three main levels, namely low (primary), intermediate, and high. In order to combine speed and flexibility, an optimum hardware/software configuration is required. For multitask primary processing, a pipeline configuration is proposed. This structure, which is an interface between the sensing element (camera) and the main processing system, achieves real time video signal preprocessing, during the image acquisition time. In order to form the working neighborhoods, the input image signal is delayed (two lines and three pixels). Thus, locally 3×3 type processing modules are created. A successive comparison median filter and a logical filter for edge detection are implemented for a pipeline configuration. On the other hand, for low level, intermediate, and high level operations, software algorithms on parallel platforms are proposed. Finally, a case study of lines detection using directional filter discusses the performance dependency on number of processors. “Real-time” is an elusive term that is often used to describe a wide variety of image/video processing systems and algorithms. Considering the need for real-time image/video processing and how this need can be met by exploiting the inherent parallelism in an algorithm, it becomes important to discuss what exactly is meant by the term “real-time”. From the literature, it can be derived that there are three main interpretations of the concept of “real-time,” namely real-time in the perceptual sense, real-time in the software engineering sense, and real-time in the signal processing sense.